Technically, I wasn’t a Santa Cruz virgin. When I was a grad student living at the VA Hospital’s staff quarters in Palo Alto, on a lark, a gang of us drove down to Santa Cruz. We slept on the beach, and when we awoke the next morning, we discovered a miracle had occurred during the night. My black Volkswagen Beetle had transmogrified from black to white. We later ascertained the source of the miracle: a nearby cement plant. Took a lot of washing to get my Bug back to black. So. Technically not a virgin. But for all intents, a virgin. I returned to Santa Cruz determined to lose that virginity. And immediately discovered that all my assumptions about it —Santa Cruz, not virginity — were wrong. It’s a California seacoast town, so I pictured flat and sandy. Just the opposite — Santa Cruz is hilly and densely wooded. Highway 17, leading to the city (as opposed to the county) of Santa Cruz, snakes through dense conifers. Nearly every street in the city is lined with trees. And almost the entire, vast campus of UCSC — University of California, Santa Cruz — lies hidden in a redwood forest. Another thing I got wrong was Santa Cruz’s peaceful, open-minded history. Though the region exemplifies laidback California surf culture today, it has a grim and racist past. Of all the missions founded by Father Junipero Serra in the 18th century, Mission Santa Cruz may have been the most brutal. The local tribes were treated as slaves, mercilessly whipped, and worked half — sometimes all — to death. (In 1812, a particularly sadistic mission brother was murdered by Christian Indians who preferred not to be punished by a metal-tipped whip.) In the 1870s, an ordinance was passed banning Chinese fishermen from, yes, fishing. In the 1940s, Japanese-American farmers were rounded up and sent to prison camps far, far from home. Santa Cruz has come a long way, baby. In parks and beaches, at restaurants and museums, while fishing or skateboarding, people of every hue mix and mingle. Capitola. A seaside town whose wide, sandy beach is lined with restaurants and bars, Capitola’s waters are alive with canoes and kayaks. 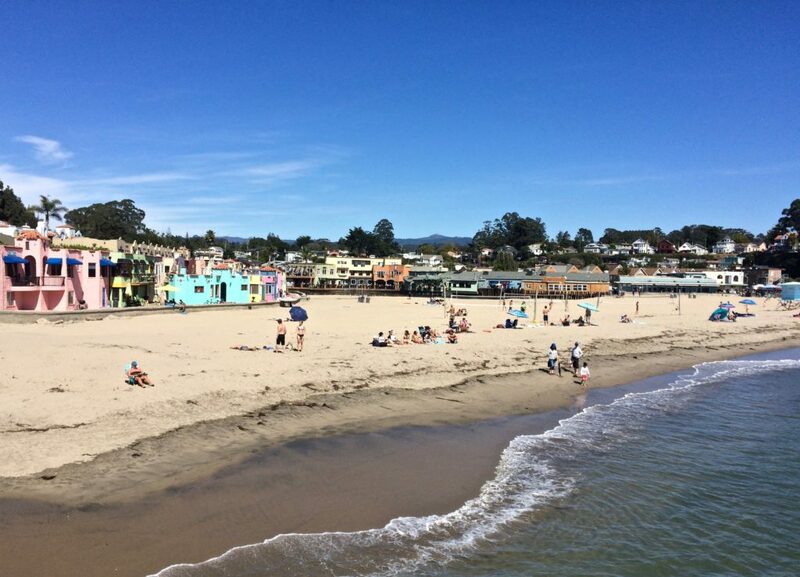 And Capitola is home to the Venetian Court, built in the 1920s as California’s first beachside condominiums. Today, they are still intensely charming, and some are available as vacation rentals. Virgin’s Tip: Hitchcock’s The Birds was based on a Capitola event. In 1961, crazed birds attacked the town. Hitchcock read about it, and the rest is movie history. Aptos. 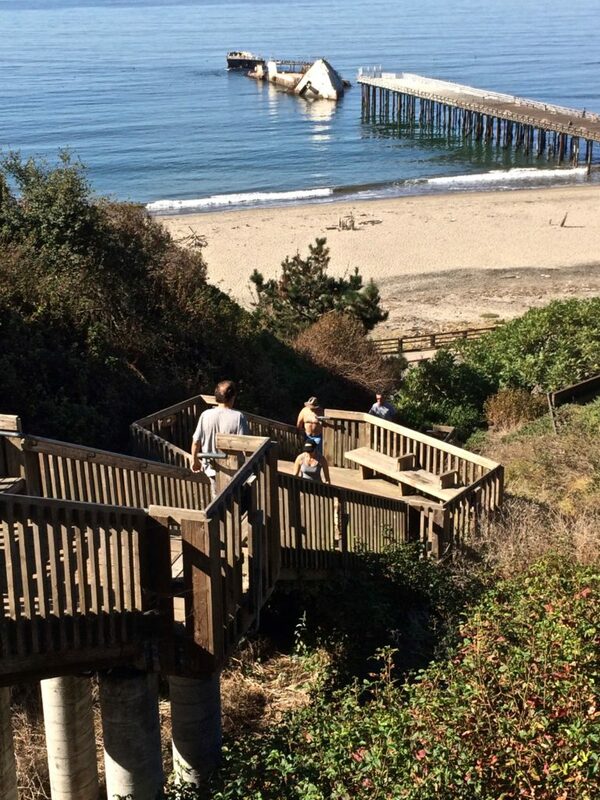 Seacliff State Beach State Park is best known for the Cement Ship. Built at the end of World War One when steel was in short supply, it never went to sea. The war ended, and for a couple of years after, it served as a restaurant and dance hall. Long after it was abandoned, the ship remained intact until the winter storms of 2015-16 broke it in half. You can watch it slowly crumble from the beach or pier. Another pleasure of Aptos is the Esplanade, perfect for watching the sun set over Monterey Bay. When you finish watching, cross the street to the Café Rio Aptos for exceptional seafood and risotto. Pleasure Point. In Santa Cruz, Pleasure Point lets you view surfing culture at play, and on Lighthouse Point, at the Surfing Museum, in historic context. It’s there you’ll learn that surfing was introduced to the US by three Hawaiian princes who were studying in Santa Cruz. Watsonville. From Interstate 101, Watsonville looks like an important agricultural valley. It is that, but off the highway, this Santa Cruz County town has a number of attractions worth visiting. First stop, Annieglass. Founded and run by ex-hippie Annie Morhauser, it’s where artistic glass serveware is sustainably created from plain window glass. Studio tours are free, Thursday-Sunday at 1:30. Virgin’s Tip: The gift shop sells Annie’s creations … and lower-priced seconds. Down the road is where Roy Johnson creates unique lighting fixtures at Johnson Art Studio. I went there after admiring the creative lighting in the hotel where I was staying, the Best Western Seacliff Inn in Aptos. 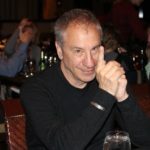 In the midst of an industrial park, Roy not only makes the lights, he invents the machines that let him make the lights. Next door, is the best place for breakfast and lunch in Watsonville, the Beach Street Café, a fixture since 1979. Virgin’s Tip: Share your order — portions are huge. The final Watsonville stop in another place I got all wrong, Martinelli’s Company Store. Every Thanksgiving, we buy a couple of bottles of Martinelli’s Sparkling Cider for guests who don’t drink alcohol. I’ve always assumed it comes in one flavor and is a subsidy of Pepsico or Comcast. Both wrong. 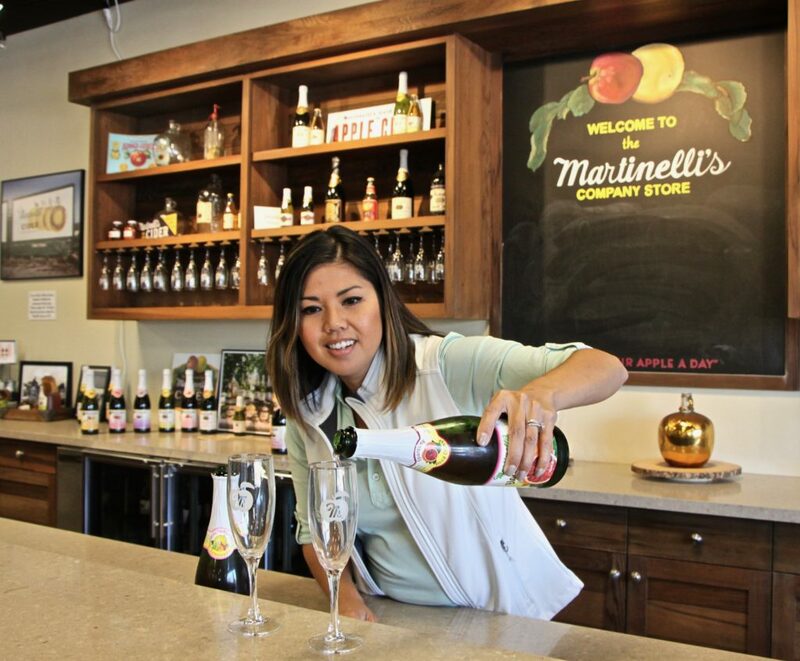 The cider comes in a dozen or so flavors (including apple-mango and apple-pomegranate), and the company has been owned by the Martinelli family for 150 years. You can learn and taste in the Company Store. It’s like a Napa tasting room without the alcohol. Final Virgin’s Tip: MAH. If there’s one must-stop in Santa Cruz, it’s MAH, the Santa Cruz Museum of Art and History. Plunk in the middle of downtown, it’s as lively and inviting, family-friendly and hands-on a museum as you’ll find anywhere. 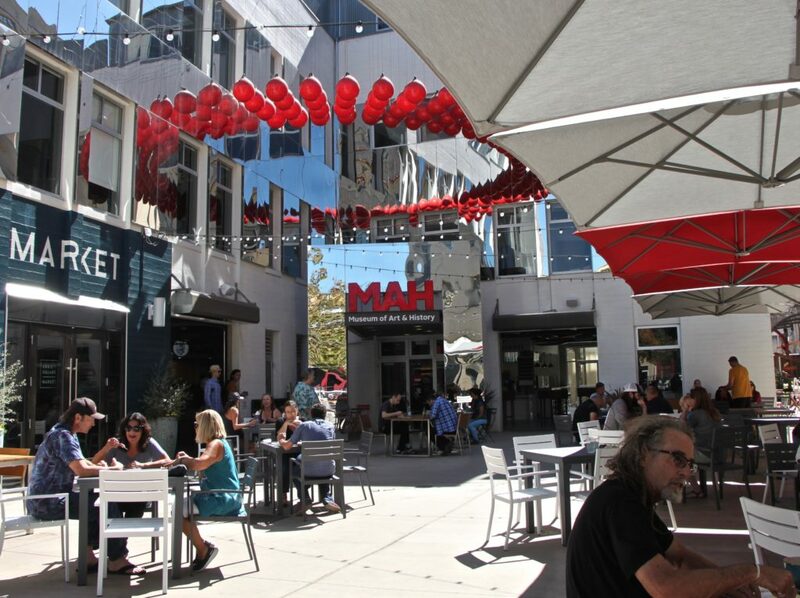 Smart planning means quiet outdoor spaces and tasty choices of what to eat and where to eat it. Loved it. And glad to kiss that Santa Cruz virginity good-bye.